The 10 year follow on to the J-LIT study is out. My view and update of the original J-LIT study was that it was one of the better statin studies and provided more information on the effects of pharmacologically lowered cholesterol levels, on a background of the known pleiotropic effects of the statin drugs, than most other studies. At a fixed dose of simvastatin (mostly 5mg per person per day) there is a relative beneficial effect if your statin induced hypocholesterolaemia is mild, with a significant increase in cardiovascular, cancer and all cause mortality if your TC drops below 160mg/dl and/or your LDL-C drops below 80mg/dl. Well now the 10 year follow up is published. What happens at the 10 year mark? Well, you are as welcome to try and find out as me, but I've failed. There is a tabulated display of cardiac "events" vs on-study cholesterol levels in the results section. That's it. They have mortality data, including cardiac deaths and cancer deaths, for each cholesterol grouping, but these are not mentioned (they were there in J-LIT). Perhaps they have decided that we will be so preoccupied with the reduction in cardiac "events" that the risk of dying becomes so unimportant that we won't want to know about it. Well I'd like to know. "The relative risk of all-cause mortality was also analyzed in relation to the average serum lipid levels during the 10-year treatment period in the primary prevention cohort study (data not shown comment: You bet it's not shown!). 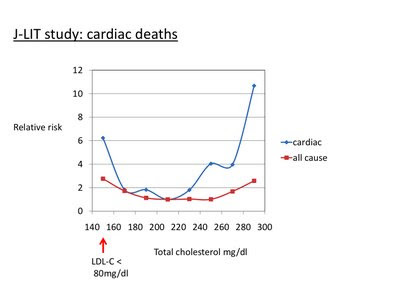 The results were the same as those in the previous report.2"
Now of course all studious cardiologists will naturally want to know exactly how lethal low cholesterol levels are, so will look up reference 2. You think not? Well, just to help out, here are the all cause mortality data from the 6 year report cited as ref 2 and plotted by TC intervals. The LDL-C vs all cause mortality curve is the same shape but a bit flatter. Look at the left hand end. The left hand end is where these cardiologists want you to be. There is no difference between the data at 6 years vs those at 10 years is what they say. Seriously low TC or LDL-C will significantly increase you risk of being dead. Obviously, if you are a cardiologist, that is far better than having a cardiac "event"! This 10 year report MUST also have the relative risk data for cardiac death in the low cholesterol group but they have forgotten to even mention it. I'd just remind you that in the original J-LIT study cardiac mortality was 6.23 time higher in the group with TC below 160mg/dl vs the reference group with TC of 200-219mg/dl. Again, perhaps having someone dead is less tiresome than having to manage a pesky survival heart attack. I dunno. BTW the LDL-C concentration in the group with TC <160mg/dl and 6.23 times relative risk of cardiac death was <80mg/dl, ie cardiological Nirvana. "However, the overall mortality rate of the primary prevention cohort was higher during the 10-year period (4.47 deaths per 1,000 patient-years) than for the 6-year J-LIT period (3.69 deaths per 1,000 patient-years). The main factor contributing to the increase of mortality in the present study was probably aging, because the mean age had increased by 6 years for this extension study compared with that for the original J-LIT study"
Reading carefully here it seems they were comparing death rate in the first 6 years with death rate in the total 10 years, which included the first 6 years. That is, the all cause mortality in the last 4 years of the study must have been quite a bit higher per year than the overall quoted 10 year value as it is diluted down by the inclusion of the first six year value. Reverse engineering the numbers ties my brain in a knot. But that's how it has to be. What was to stop them adjusting the figures for age? Maybe the result! They scared themselves with their honesty about mortality in the original J-LIT study and so they have been a lot more cautious with data release this time around. So how do you sum up Son of J-LIT? Dead bodies are less worrisome than cardiac "events". PS I think I have commented that the original J-LIT study could be repeated on any cohort of people on a fixed dose of a given statin and that this has never been done, for obvious reasons. I think we can add that the exercise is so scary to a statinator that even the original J-LIT investigators have refused to repeat the exercise, even though they are the developers of the methodology and have the same cohort available. Wow. Just a few comments after reading through Stan's latest dodgy paper, the one by D'Anci et al in Appetite. "The present study examined how the initial stages of two weight-reducing diets, a low-carbohydrate diet similar to the AtkinsTM diet, and another with macronutrients proportions typically recommended by the American Dietetic Association (ADA), affect cognitive performance"
Okaaaay. A week of zero carbs, a week of under 8g/d and a week of under 16g/day. If anyone has a spare copy of Dr Atkins New Diet Revolution, perhaps they could send it to D'Anci. She might even read it before her next "similar to the AtkinsTM" study. Or maybe not. After all, quoting the AtkinsTM diet is hard for a main stream nutritionist who thinks high fibre, brightly coloured, mostly leaf based vegetables are actually healthy. Especially the number of servings Atkins suggested of this mainstream approved garbage. You don't get many of the AtkinsTM induction veggies on zero carbs per day! "To mimic this pattern of restriction and reintroduction of dietary carbohydrate, participants followed a 3-week dietary regimen that included a 1-week period that eliminated carbohydrates. We proposed that dietary carbohydrate restriction would impair cognitive performance in the early phases of the diet, and that this impairment would be ameliorated by the reintroduction of carbohydrate"
"...weight loss was not significantly different over the 3-week experimental period, weight loss was less than 2 kg in each group (LC diet M = 1.88 kg; ADA diet M = 1.76 kg; n.s.)" This is impressive. I can't really see how they achieved this. On an intensely ketogenic, carbohydrate restricted diet there was only slightly more weight loss in the LC group than could be achieved by simply following the ADA advice for weight loss. You would have expected the water loss from metabolism of liver glycogen would have accounted for a significantly greater weight loss in the first week in the zero carb group compared to the ADA group. How can this be? Beats me. Maybe the LC group were told to eat enough protein to keep out of ketosis? How can you tell? Nothing in the methods. "Hunger ratings did not vary between the two diet conditions"
"Individuals who selected the ADA diet calculated their recommended caloric intake per day based on their current weight"
"An individualized reduced calorie diet is the basis of the dietary component of a comprehensive weight management program. Reducing dietary fat and/or carbohydrates is a practical way to create a caloric deficit of 500 – 1000 kcals below estimated energy needs and should result in a weight loss of 1 – 2 lbs per week." It doesn't actually say anywhere in the paper how much of anything the participants ate! But what ever they ate, they were either HUNGRY on the AtkinsTM like diet or not hungry at all on a caloric deficit of up to 1000kcal on the ADA diet. Smell of fish here? "Participants most likely selected into a diet best fit their eating habits, although this was not assessed. If so, the diet conditions may not have been sufficiently different from normal to produce much dysphoria or food preoccupation"
Zero carb is close to the diet of exactly how many Americans? "Another common phrase may be an important reminder to these prospective dieters—You Are What you Eat"
Humans are fat and protein, with a little carbohydrate thrown in. Maybe that's what we should eat! You would be forgiven for thinking that the apoB100 protein (which defines the LDL or VLDL particle) has been evolved over the past 4.5 billion years to cause cardiovascular disease and the less of it you have the longer you will live. Listening to a cardiologist that is (or a BBC reporter on the Today Program grovelling before a cardiologist). The lower the better. It's impossible to have too low an LDL concentration. Statins in the drinking water. You know the patter. Until you go in to hospital that is. Do you want an MRSA infection? The apoB100 protein and its LDL particle are part of the innate immune system. 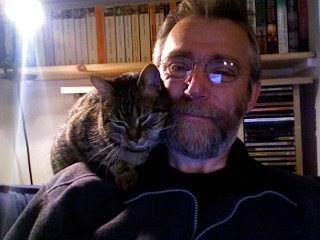 OK, financial declaration time: Our household is 50% funded by the tail end of a PhD grant for a thesis on the innate immune system. If the post doc grant does not come through we're in big trouble. So the innate immune system REALLY matters. To us anyway. Once upon a time you died in the ICU of overwhelming pseudomonas infection. Nowadays it's MRSA. Methycillin resistant staphylococcus aureus is an ubiquitous and mostly pretty harmless bug, unless you get ill. Then you can get in to serious trouble with it. Or maybe not... so what decides whether you live or die? MRSA has a switch in its DNA which controls 4 genes that determine whether it sits on the skin surface as a virtual commensal or invades the tissues as a pathogen. One of these genes codes for a signalling peptide called AIP. In fact there is a choice of four different AIPs, AIP 1 being the one possessed by many particularly nasty clinical isolates of MRSA. AIP 1 is essential for the virulence of the bug and it is bound by the apoB100 protein. This binding is particularly effective when the protein is where it belongs, sitting on the surface of an LDL or VLDL particle. What seems to happen is that the AIP 1, which is lipid soluble, ends up in the lipid centre of the lipoprotein. In the mele of an acute infection the LDL particle becomes oxidised and so gets eaten, along with its AIP 1 burden, by a macrophage. Thus endeth the virulence factor of the MRSA, unless you have particularly low LDL or VLDL lipoprotein levels. In which case you are in big trouble. The abstract of the AIP paper is here if you fancy a read. I was interested in the post Stan put up about medium chain triglycerides and Alzheimers Disease. I particularly like the pictorial record of the clock faces, showing memory improving quite markedly within 37 days. One of the first posts I ever put up on Hyperlipid was the use of the full blown ketogenic diet for the partial reversal of Parkinsons Disease. As far as I can see AD, PD and ALS are all essentially the same disease, but the genetics of your glutamate receptor subtypes or quirks of your glutamate processing enzymes determine which you get. They're excitotoxin diseases, and Russell Blaylock has the most self consistent hypothesis of their generation that I've come across. According to Blaylock the glutamate neurotransmitter receptor sporting cells can be driven to a catastrophic energy failure under certain conditions. Adding ketones as an alternative to glucose appears to supply energy to allow both survival and improved function of neurones which are doing very badly on glucose. Having read Vanitallie's abstract and Marilyn Deaton's account of eating an extreme ketogenic diet, I'd imagined that we would be needing ketones ++++++, ie. off the top of the scale, as for the rather problematic ketogenic epilepsy diet (especially if designed by a cholesterophobic nutritionist). But Dr Mary Newport got a detectable effect within 24 hours from 40ml, or 350kcal, of coconut oil. Without carbohydrate restriction. That's pretty impressive. BTW, if anyone else has already read this account, are you as puzzled as me as to how Mr Newport could stay in a drugs trial while confounding the outcome, admirably so, with MCT derived ketones? I think this is what the article says, correct me if I am wrong. So the neuroprotection appears to kick in at very low levels of ketones. It might not even be necessary to go to Atkins induction. Something as mildly ketogenic as the Optimal Diet might just do the job. Although 0.8g/kg/d of carbs will keep you out of ketosis, you certainly have elevated ketones compared to the average person on a modern industrial diet... Plus once you start eating real food without excitotoxins the rate of progress might just slow too. I like to have a few ketones on tap. While I was googling to find out how ketogenic eating about 10% of calories from MCTs is, when added to a standard diet, I came across this gem from 1984. They fed their rats 5%, 15% or 25% of calories from MCT or long chain fats and measured all sorts of things including weight gain and calorie intake. Look at the calorie intake of the diabetic rats! For normal rats diet composition made no difference to food intake. 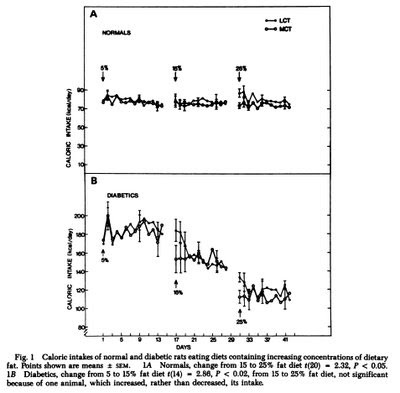 For diabetic rats (streptozotocin induced) see how appetite skyrocketed on low fat but virtually normalised with increasing fat content (any fat) by the time fat got up to 25% of calories. The lower the fat content, the more hyperphagic (read HUNGRY) the rats became, the fatter they became too. It just reminded me of the cruelty of telling human diabetics to eat a low fat, high carbohydrate diet and then berating them for their gross gluttony. People keep inventing the wheel but it keeps getting lost! BTW 15% of calories from MCTs produces about 0.3mmol/l of ketones in the plasma of a rat. My Ketostix would show 0.3mmol/l in urine as a faint trace. Seems quite modest compared to a ketogenic diet, but certainly delivers something. Hyperlipid is now getting back to a reasonable semblance of normality. I'll try to answer the comments as soon as I can. What happened? Well, about six weeks ago I was invited to join THINCS. Within two weeks of my email address going up on the THINCS website I was invited by the Skeptics Society of St Paul's School in London to present a 40 minute overview of why I was unconvinced by the lipid hypothesis of CHD. After some initial teething problems due to lack of software ownership (resulting in a crash course of teach yourself Powerpoint on my wife's PC), I got a presentation together. It was two and a half hours long. Major butchery got it down to an hour and a half. Has anyone ever tried to demolish the lipid hypothesis in just over 30 minutes? The presentation was last Tuesday and it was a really enjoyable day for all of us. Staff and sixthformers were very interested and the discussion carried on over lunch. I had pitched the talk as neutral as possible, just draw the graphs, discuss the studies and let the science speak for itself. Never mind statin bashing or the weird data from the 4S study. Interestingly, most of the audience were perfectly willing to draw their own conclusions about data manipulation if you show them Yerushalmy and Hilleboe's paper analysing Keys' Six Countries Study (many thanks Alex). I never did mention the 4S study data. A number of people commented, positively, on this fairly dead pan approach. You don't need to be aggressive or sarcastic to make your point when the facts speak for themselves so clearly. It all took a great deal of preparation. In addition to this my wife is in the last two weeks of the lab work of her PhD (she has ligands, that's good! Woohoo, happy dance) and will start writing up over Christmas... Anyone who has played the PhD game will know exactly what this has meant for the last few months and what it will mean for the next few months. PhDs are not intended to be recreational! So posting when I can and I'll answer the off blog outstanding emails soon. When I get to comments about a discussion forum, I agree, it would be a great idea but I think it would be impossible to do at the present time from my commitment perspective. I'm about 350 emails behind (just reading) on the THINCS discussion board at the moment.